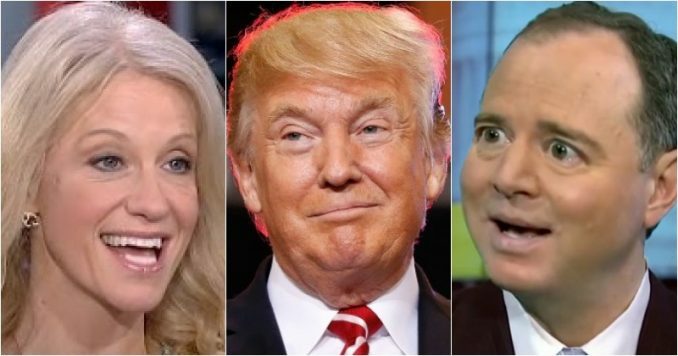 Rep. Adam “Shifty” Schiff is continuing to say that President Donald Trump colluded with the Russians and obstructed justice even after the Mueller report says the opposite. Well, Kelleyanne Conway torched Schiff so badly the California Democrat looks like an utter fool. You’ll love this. Special Counsel Robert Mueller’s two-year-long investigation is finally over. After $25 million dollars spent in an exhaustive investigation, he could not find evidence that President Donald Trump colluded with the Russians. Yet, Adam “Shifty” Schiff won’t accept the truth or reality. Except, after $25 million dollars spent on 19 lawyers, along with 40 FBI agents, and 2800 subpoenas, with over 500 witnesses, Mueller found no such collusion. But, Robert Mueller knew he had to leave the door open in some small way so the Democrats could move forward with their impeachment plan. So, he politicized the obstruction of justice charge. Well, of course, he would. The obstruction charge is all about his best friend James Comey and the question did Trump “obstruct justice” when he fired the former FBI Director. “What we find in the Barr letter about the Obstruction investigation is blood boiling. Here Team Mueller intentionally politicize their non-finding in an attempt to open the door for Nancy Pelosi and Jerry Nadler to exploit an impeachment angle,” the Conservative Treehouse reports. Mueller leaves the decision about obstruction open so AG Barr is left having to make the call. And Barr concludes after weighing all the facts that Trump did not obstruct justice. It’s really a no-brainer. If Trump did not collude with the Russians, then firing James Comey could not be about trying to stop the Russia investigation, hence he was not obstructing justice. Mueller spent two years investigating obstruction of justice and found evidence that “does not exonerate” Trump. Barr took two days to set aside that evidence. The entire report must be published and evidence provided to Congress so the American people can judge for themselves. “He ought to resign today,” Conway said. “He’s been on every TV show 50 times a day for practically the last two years, promising Americans that this president would either be impeached or indicted.” Americans were just as angry with the California Democrat who has for over two years lied to Americans claiming he had the evidence that Trump colluded with Russians and that he thought the president would be indicted. “We have all followed this investigation with an open mind, all 677 days of it. We have also spent tens of millions of dollars doing so. The result overall:: NO COLLUSION. What are we left thinking? You have weird eyes. Try to focus a little better, Adam,” tweeted Jen Farley. We have all followed this investigation with an open mind, all 677 days of it. We have also spent tens of millions of dollars doing so. The result overall:: NO COLLUSION. What are we left thinking? You have weird eyes. Try to focus a little better, Adam. Schiff received thousands of responses to his ridiculous tweets and remarks, and Americans are so fatigued of his continued ranting and raving. The Representative from California has no honor. He knows the president did not commit the crimes he continues to accuse him of, yet he is incapable of uttering the truth. Here’s hoping those Americans who voted for the Democrats open their eyes. The Trump-haters in Congress have wasted millions of taxpayers money knowing this entire case was totally fabricated by the deep state rats who were driven by the fear they would lose their power when Trump was elected. So, make sure all your family and friends know the Democrats will continue to have investigations into the bogus charges even though the Mueller report is out. Americans must demand they stop the insanity. The country can’t heal as long as rats like Adam Schiff continue to refuse the Special Counsel’s findings. It’s over, now let’s move on to re-elect President Trump who despite this terrible distraction has kept his promise in making America great again. Rebecca Diserio is a conservative writer and speaker who has been featured in numerous high profile publications. She's a graduate of St. Joseph High School in Lakewood, CA and worked as a Critical Care Registered Nurse at USC Medical Center. A former Tea Party spokesman, she helped manage Star Parker’s campaign for US Congress and hosted a popular conservative radio show where she interviewed Dr. Alveda King, Ann Coulter, David Limbaugh, and Michelle Malkin. A police widow, she resides in Southern California.